(same project, slightly different writeup)--Thanks! I adopted a really cute dog from a rescue organization (NARF) two weeks ago. Her name is Tulip. She came with a collar, but she clearly needed a harness for "walkies" or she'd choke herself pulling on the collar. I still have the leftover jeans parts from my jeans circle quilt, dining room chair covers, and other jeans projects. Since most of these used leg pieces, I have plenty of waistbands and upper sections handy. Time for some serious seam ripping! I started with the one waistband and the attached upper back section of the jeans. I removed the back pockets to save for some other project. I cut the section to get a rough fit under and around Tulip's chest. I also used a waistband from another pair of jeans. Here is the chest part after stitching to fit Tulip. The separate collar section on the right is sewn closed, so the jeans button is now just decorative. The collar part just slips over Tulip's head. I salvaged the buckle and webbing strap from one of my kids' old lunchboxes. My kids go through at least a couple a year by doing things like leaving spilled milk in them over Spring vacation (mmm, yum! ), dragging them over concrete, and other things, so I regularly scavenge useful buckles, hardware, zippers, and straps from them (the picture shows a newer one). I used part of another waistband to make the strap that goes between the collar and the chest strap, and sewed on a reused belt loop to hold the D-ring. One thing I should mention is that I used a really simple-but-useful little gadget called the "JEAN-A-MA-JIG" by Dritz to sew over the really thick parts where the jeans seams and the belt loops were. This helps to prevent the stitches skipping when the presser foot is going up or down at a steep angle when you go over the big hump in the fabric. The sewing still wasn't easy, but it was better. It actually turned out that for my machine with the "walking foot" (that contraption that includes the presser foot and sticks out behind the presser foot--it helps keep multiple layers from sliding out of place), I needed a thinner version to put under the foot in the back, while the thicker "JEAN-A-MA-JIG" fit under the front side. I made the thinner version from a plastic soft drink cup that was languishing in my recycling bin. Here is the finished harness. The second button has been replaced on the chest strap so I would have two matching Levi's buttons. It is also sewn closed and is now just decorative, since the lunchbox buckle provides the adjustable fastening. If you look carefully, you can see that I completely removed the waistband that goes around the chest and then sewed it and the belt loop back on so the button and buttonhole would be in the right place! Tulip is fortunately much smaller than the original 36-inch waist. The triangular section goes on the dog's chest. Here is the finished harness looking down at the top (the dog's back). The buckle strap goes through a loop on the D-ring section. Here's the whole doggy-infatuated gang! 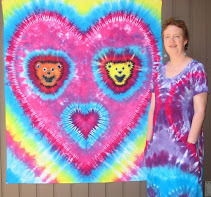 That's me in one of my favorite gaudy tie-dyed T-shirts. Hi, Sara! This is a fantastic jean recycle, I love it! Definitely voting for you on MAKE. Your pups are pretty cute, too!